Peel, then cut each banana in half crosswise and insert a craft stick into each half. Place on a tray, cover with plastic wrap and place in the freezer until frozen – about 3 hours. Place the peanuts or sprinkles in a shallow dish or on a plate. Melt the chocolate in the top of a double boiler over slightly simmering water – over the lowest possible heat – stirring frequently. Make sure the water is not touching the bottom of the top pan. Pour the melted chocolate into a thin tall glass. 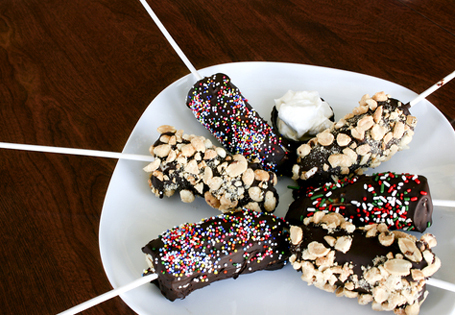 Dip each frozen banana into the chocolate, turning it to coat, and immediately roll in the peanuts and/or sprinkles. Place on a tray covered in waxed or baking paper. Serve immediately or wrap individually in plastic wrap or waxed paper and freeze for up to 2 weeks.